It was labor day in the United States, which means no labor, and I took the kids to a drive thru wildlife ranch. The place has a lot of African animals, mostly ungulates, and they hang out near the road for the kids to see and throw out food for. I thought it would also be fun to take the zoom lens and try to get some animal photos. So every picture here was shot with a Nikon D750 and Sigma 70-200mm zoom. The first animal is some sort of horned antelope that I couldn’t identify. I apologize for my zoological ignorance. I spent quite a bit of time waiting for animals to look my way because I wasn’t really after photos of animal backsides. This one looked right at me for a nice close-up through the car window and I like the photo. 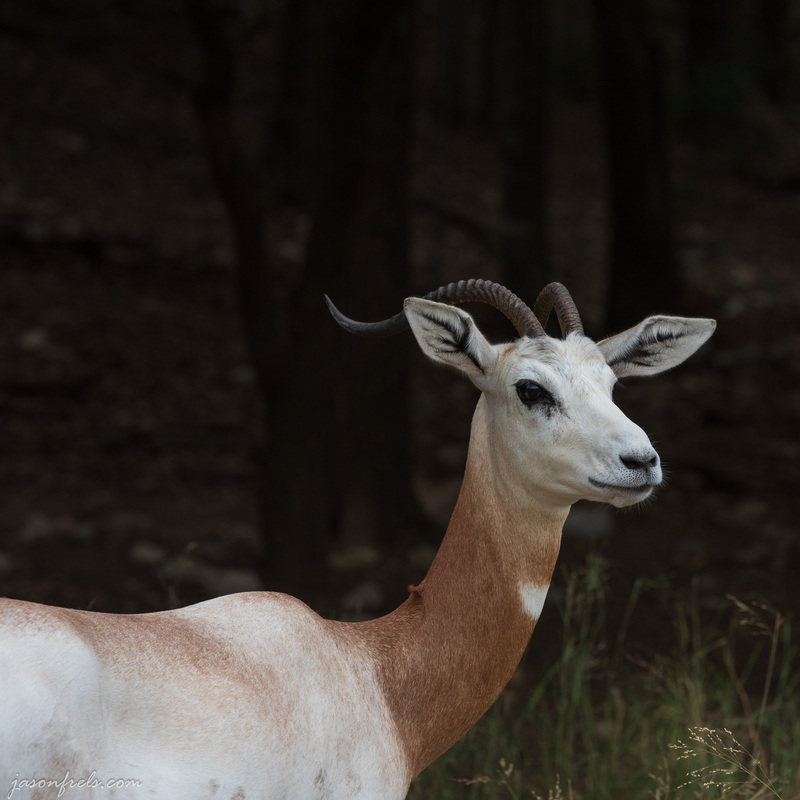 Being so close to the camera, the background blurs away nicely and doesn’t distract from the antelope. I went with a square crop for the image as I think that this crop fits the animal’s head. There really isn’t much to see right or left of this photo anyway. I was shooting through the car window and this guy wasn’t far away and he posed for a photo. 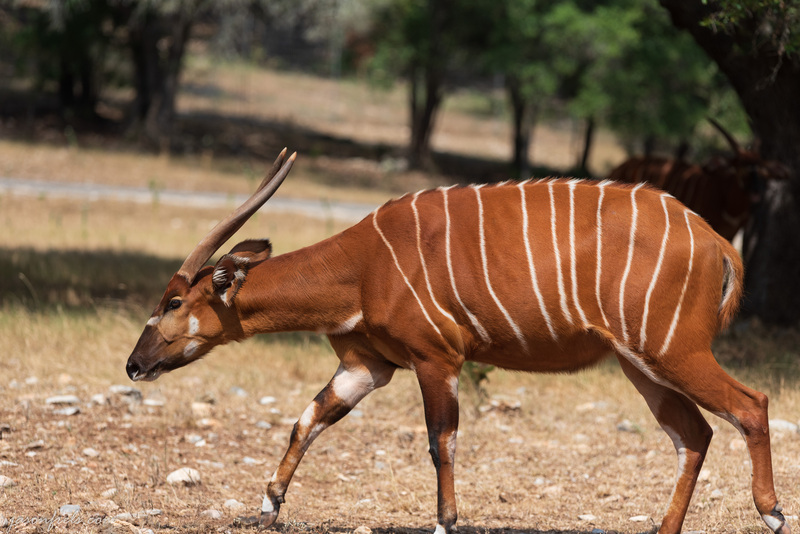 There were quite a few of these striped antelopes called Bongos that I thought were pretty. I spent quite a bit of time trying to get one separated enough from the background to read well. And I think that I got a good profile to show off his stripes and horns. It was raining on and off and the sun was in and out of the clouds. I was able to get sunlight on the Bongo antelope which looked nice on his warm toned fur. It might have been better later in the day, but this is when I was here. I managed to miss most of his hooves as I was shooting across the car out the passenger’s window. But I like that the Bongo is walking and the photo has some motion to it. I guess if you didn’t know any better, you might think this was taken in Africa. The next one is a Dama Gazelle. I waited around a bit for this one to turn her face so I could see it. I like the brown color on the animal’s neck and its white face shows up well against the shady background. Even the curvy horns looks stylish. This is another square crop to focus only on the gazelle, but in hindsight I might have left some room to the right to give her somewhere to look. As someone who enjoys shooting landscapes, I don’t often consider doing square crops. There were also rhinos, zebras, ostriches, emus, giraffes, monkeys, etc. but these were the photos that I was most happy with. I had a lot of trouble isolating the subject from its background and sitting in a car didn’t give me a lot of room to move around. Aside from the occasional heavy downpours, it wasn’t a bad afternoon. I didn’t hear many complaints from the kids and I got to shoot a few photos. 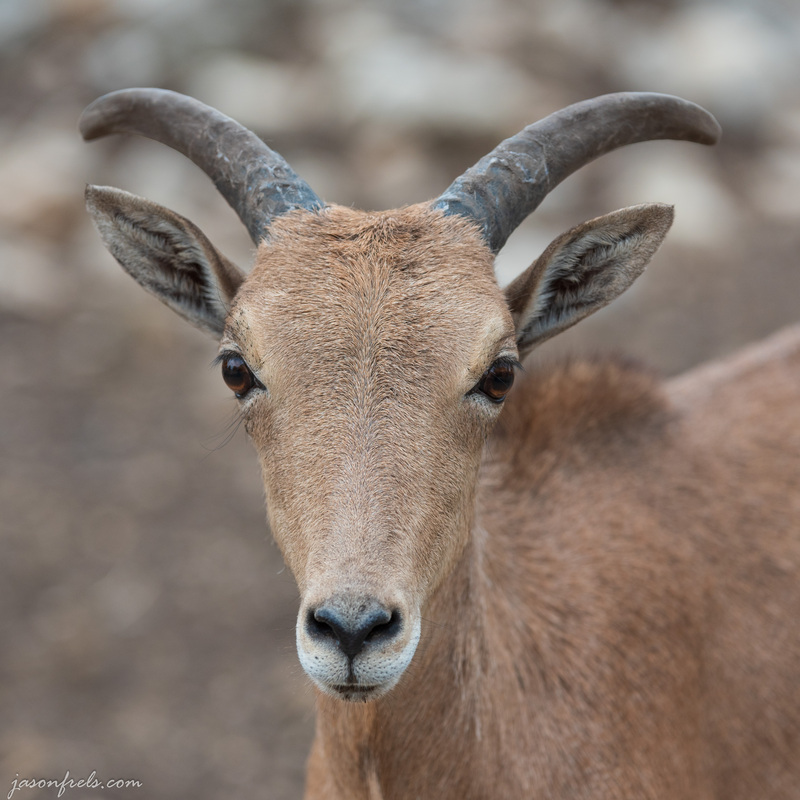 I like the first antelope, the square crop suits it very well.